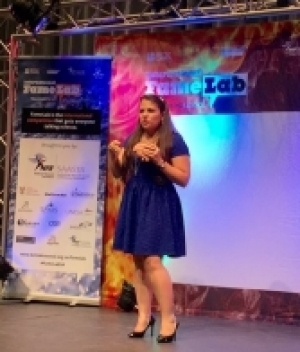 Stevie Biffen, MSc Neuroscience student in the Department of Human Biology, won the FameLab South Africa competition at the Scifest Africa - with her talk on the structure of the brain and how to be happy. FameLab is an international competition that seeks out and nurtures science communication talent. Engagement between scientists and society is essential to grow a critically informed society and ensure that science remains relevant and responsive to societal needs. You can read more about the 2015 FameLab South Africa finals online, in this news article in Die Burger, and browse the gallery on Jive Media Africa's Facebook page or watch the finals on Youtube.